Angela Moody contacted one of our website design freelancers, Sam Stebbins, in order to get a website created for their property management company, Premier Property Management. 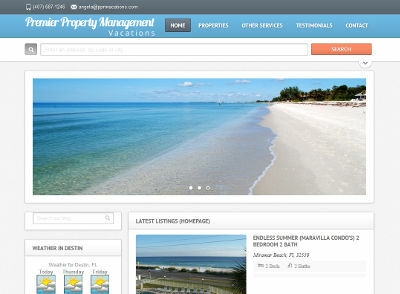 They specialize in listing and managing vacation rentals in and around the Destin, FL area. Sam worked with Angela to get the website completed and setup over the course of two months.